link Three ships carrying Turkish activists have set off from Turkey to Gaza on Saturday, the biggest effort by international aid groups to break the Israeli siege on the Gaza Strip. The biggest of the nine ships from Istanbul is heading to the south western city of Antalya where two other Turkish ships will be waiting to join the convoy. 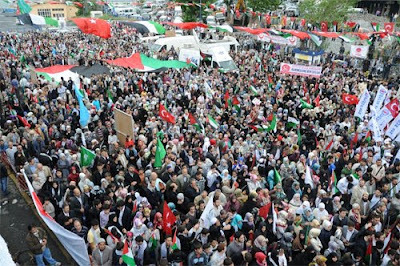 The seaport was overwhelmed by thousands of well-wishers, who had come to show their support for the people of Gaza. The three ships will then travel to the waters off Athens and Crete to rendezvous with the other six, before making the four-day journey to Gaza. The second ship to join the Freedom Flotilla en route to Gaza left Istanbul Saturday afternoon, joining eight other boats from three countries carrying 10,000 tons of aid for Gaza's residents, supplies embargoed by Israel. 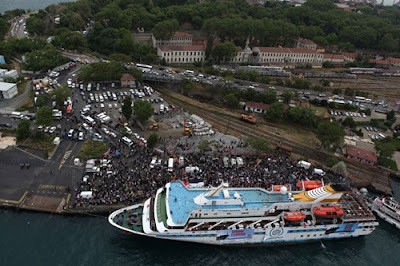 A statement issued by the Freedom Flotilla's organizers said the latest ship is sponsored by the Turkish humanitarian organization or IHH and will carry 600 passengers to Gaza as part of the "blockade busting" flotilla. Boats will meet in the Mediterranean, then turn toward Gaza to arrive at its beseiged slice of beachfront by the end of May. Free Gaza Movement’s MV Rachel Corrie is already en route from Ireland and is presently off the coast of Portugal loaded with cement, paper and supplies for school children and medical equipment, the statement said. Rachel Corrie was a US peace activist who was killed by an Israeli army bulldozer in Gaza in 2003. The convoy is from the UK, Ireland, Algeria, Kuwait, Greece and Turkey, and is comprised of people from 50 nationalities. It is made up of three cargo ships and five passengers boats. But, news reports from Israel indicated that Tel Aviv will attempt to prevent the ships from reaching the blockaded coastal enclave. A statement from Israel's foreign ministry said it had "no intention of allowing the flotilla into Gaza" but has not elaborated on what measures could be used to stop them. Representatives from six organisations, including the European Campaign to End the Siege in Gaza (EGESG), said they were determined to enter the area regardless of pressure from Israel. Israel should not be under any illusion whatsoever that their threats or intimidation will stop us or even that their violence against us will stop us," Huwaida Arraf, from the Free Gaza Movement, said. Kahel Mazen, from EGESG, added: "If they choose to resort to destruction and death, our mission is to try to open a window of hope for the people of Gaza." Earlier this month, UN Relief and Works Agency for Palestine Refugees director John Ging called upon the international community to break the siege on the Gaza Strip by sending ships loaded with aid. "We believe that Israel will not intercept these vessels because the sea is open and human rights organisations have been successful in similar previous operations, proving that breaking the siege of Gaza is possible," Mr Ging declared. Gaza is still considered under Israeli occupation as Israel controls air, sea and land access to the Strip. The Rafah crossing with Egypt, Gaza's sole border crossing that bypasses Israel, rarely opens as Egypt is under immense US and Israeli pressure to keep the crossing shut.